A Federal High Court sitting in Lagos, on Wednesday sentenced an official of the Independent National Electoral Commission (INEC), Yisa Olarenwaju, charged with obtaining proceeds of unlawful act. Justice Mohammed Idris sentenced the INEC official based on a plea bargain agreement he reached with the Economic and Financial Crimes Commission (EFCC). EFCC had rearraigned, in absentia, the immediate past Petroleum Resources Minister, Diezani Alison-Madueke, alongside three officials of INEC -Christian Nwosu, Yisa Olarenwaju and Tijani Bashir. They were brought to court on a six-count charge bordering on money laundering to the tune of N500 million, which they pleaded not guilty but the second defendant later changed his plea to guilty. Olarenwaju, thereafter, entered into a plea bargain agreement with the EFCC on May 2. At the resumed hearing, Justice Mohammed Idris convicted and sentenced the INEC official. 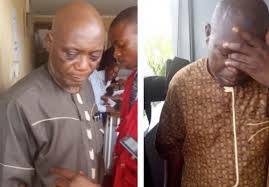 In sentencing the INEC official, Olarenwaju, who is the second defendant, Justice Idris held that, “there is no doubt that the second defendant is an elderly man.” It is also not in contention that the second defendant is a first time offender. “This court will temper justice with mercy. “The court hereby adopts the plea bargain agreement as the judgment of the court”. The plea bargain agreement stated that,” Upon the conviction of the second defendant, he should forfeit to the Federal Government of Nigeria all the parcel of land and its appurtenances which was acquired with the sum of N23 million, the proceed of the second defendant’s unlawful acts. “That a fine of N10 million be imposed on the second defendant, upon his conviction based on count four of the amended charge. ” That in paying the fine of the sum of N10 million, the second defendant shall raise a draft of N5 million in addition to the sum of N5 million already recovered from him. “He shall within seven days after the payment of the fine imposed by the court, enter into a bond with the EFCC, never to be involved in economic and financial crimes within and outside the shores of Nigeria”. The News Agency of Nigeria (NAN) reports that at the last hearing, Justice Idris had thrown out an earlier plea bargain arrangement reached by the first defendant, Christian Nwosu. The judge had clearly maintained that the plea bargain arrangement could not save Nwosu from serving a stiffer sentence. Justice Idris made a declaration that the provisions of the Administration of Criminal Justice Act (ACJA) stipulates that such a convict deserves a sentence that was stiffer. Meanwhile, the third defendant, who pleaded not guilty to the charge, was admitted to bail in the sum of N50m with two sureties in like sum. Idris held that the sureties must be owners of landed property within the court’s jurisdiction.